Council 8297 has established a KC HELP ministry in Kitsap County. 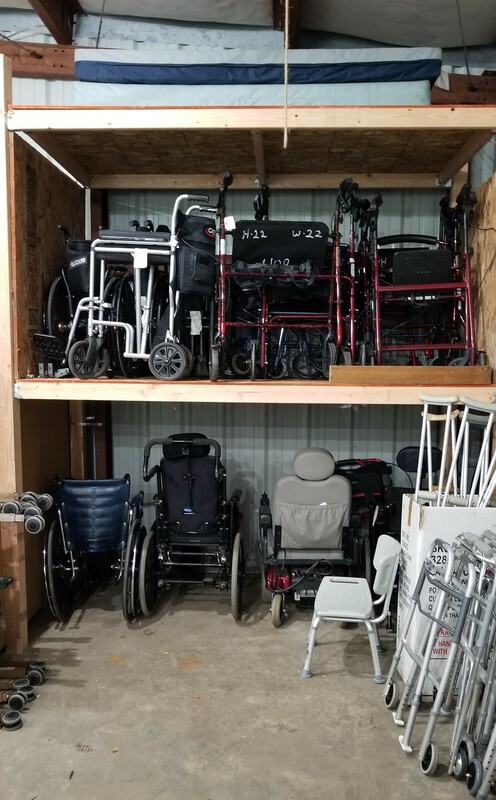 In it's early stages we are welcoming your donation of any available hospital or invalid service equipment such as wheel chairs, walkers, hospital beds, transfer benches, etc. We are also accepting donations to help with our expenses. You may use the Donate button to the right. Linked here is the current newsletter from our parent organization in the Tri-Cities. The KC HELP can provide standard hospital room equipment for people to use in their home, such as, hospital type beds, over the bed tables, lift chairs, wheel chairs, bath and shower chairs and portable bathroom equipment. When you need it. Coming home from surgery? Suffering from an injury or illness that requires bed rest? We recognize that with layoffs, decreasing company benefit programs, and rising medical costs, we can fill a needed gap. Where hardship would occur we are trying to lessen it. The KC HELP will set it up in your home. If you need other furniture moved or disassembled, the KC HELP will help do that also. Nothing. Yes that's right. There is no cost to you for the use of this equipment. The KC HELP is providing this service to the Community free of obligation. There are no qualifications. We provide the equipment based on need. Especially to those whose insurance coverage does not cover in-home rental. What if I'm only insured for some items? If your insurance can cover some of the needed items, we will try and supply the other things you need. Do I have to be Member of the Knights of Columbus? No, this program not only helps member Knights, their families and Parishioners of St. Olaf's Catholic Church, but anyone in the Community that has a need and can't obtain it through their insurance. Do I have to give you any lead time? Knowing in advance always helps us plan, but don't hesitate to call anytime. Accidents aren't planned, but when they happen, we will help. Will I have to pick it up? No, the KC HELP will deliver it, set it up, and come pick it up after you are finished with it. 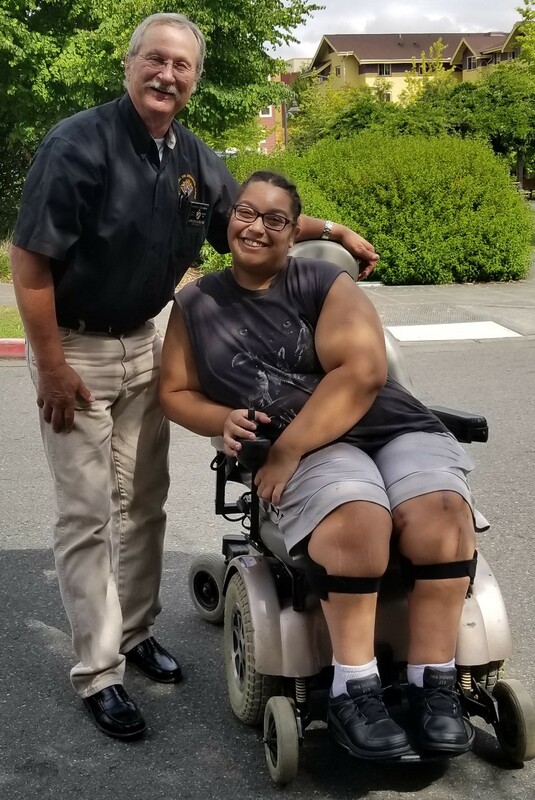 Delivered an electric wheelchair to Tiana. She's thrilled now that she'll be able to get out and enjoy some sunshine. We're thrilled to be able to help her do that! What if I need the equipment a long time? We will work with you to keep the equipment in your home as long as we possibly can. We will try to help everyone we can. Likewise, if we get low on available equipment and a critical need occurs, we may need to work something out. But we won't abandon you. Financial and equipment donations are always appreciated. Manual wheelchairs are always especially needed. The KC HELP is a non-profit charitable organization. We do not, however, expect you to make a donation nor will you ever be asked. What if I accidentally break the equipment? No problem. We will fix it or replace it as soon as we can. There is no obligation or contract. Just call us as soon as you discover something isn't working right. If I know someone in need, can I refer them to the KC HELP? Yes, please inform the person you are referring and we will follow up to see what they need. Can the KC HELP provide any nursing or home medical care? No, unfortunately we are not licensed to provide medical care service. We can help you contact other agencies that do provide in home medical care service such as Visiting Angels. Can the KC HELP provide counseling? No, we are not professional counselors and cannot offer that support. We will pray for you and we help you contact agencies, such as Catholic Charities, and others that can provide this need. Can I donate hospital equipment to the KC HELP for use in the Knights Community HELP? You bet... You can use the Donate button at the top, right side of this page. And, it's probably tax deductible!